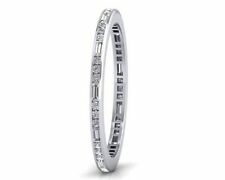 White gold diamond sapphire eternity ring. Condition is Used. Ring has had very little use so is pretty much as new, comes with all paperwork and original bill of sale and valuation certificate of 700 pounds.. I have not uploaded pictures of certificate or paperwork as all of my personal details are still on it. Further pictures on request. It comes in original box which is inside its original protective packaged box which are again all like new. An absolute stunning ring. im happy to send pictures of specs and certification if required. Thanks for looking. Dispatched with Royal Mail 1st Class. Beaverbrooks 18ct White Gold Diamond Ring With Kissing Diamond size K has 12 diamonds. Condition is Used and needs redipping in white gold costs about £30 to do. Diamond certificate comes with ring. Lovely 18ct Gold & Platinum Single Stone Brilliant Cut Diamond Ring. 18ct Gold Shank with Fancy Platinum Shoulders and Setting. 0.10 ct Diamond of Good Quality and Brightness. Size M Excellent Condition. Clarity VS2. Stunning & Beautiful 18 ct White Gold Princess 1.00 Diamond Ring. 1.00 Diamond Stamped in Shank. Colour G - H. This Beautiful Ring Has very Sparkly & Very Clear White Diamonds. This Beautiful Ring Has Been Cleaned & Polished to Perfection. 9k White Gold Diamond Ring ENGAGEMENT/OCCASION. One large diamond set between 6 small diamonds. 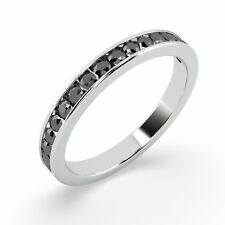 Cross over design in white gold. Size L (it's a small size!) Condition is Used. Still in good condition, great for birthday, special occasion or engagement. Dispatched with Royal Mail signed for 2nd class, will include tracking. Can change delivery service if needed. Stunning 9 Carat White Gold 0.10 Carat Diamond Ring SGL Certified (I3/G-H) in a ring size N ( US 7 ). A beautiful diamond ring set in 6.4 gms of luxurious 18k white gold. The five principal diamonds, each weighing about 5points are bezel set and accented by 9 smaller brilliant cut diamonds. It’s been professionally cleaned, currently size P this ring could easily be resized by a jeweller. Hallmarked for both 18ct and Plat. Wonderful genuine old rose cut diamonds sizes as follows Two 12 point diamonds. I didn't realise myself until looking through my jewellers' loop. One 15 point diamond. Princess Diamond Ring. Carat Weight 0.60 Carat. Carat Weight 0.30 Carat. Total Carat Weight 0.90 Carat. Shape Princess. Clarity VS. 950 Platinum (Hallmarked By London Assay Office). Diamond clarity is the gauge of how clear and flawless a gem is. Gem type Diamond. Main stone colour White H-I. Stone weight 0.1 CTW. Stone clarity I1-I2. Gorgeous diamond ring weighing in total 2.169 gms with 59 diamonds. Total est diamond weight of 0.64 cts. Comes with a ring box and fully certified card. Non refundable. Fully hallmarked for 18ct gold and has diamond amount stamped. 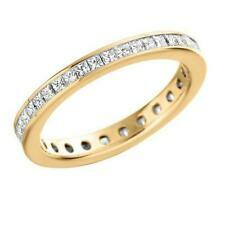 A stunning quality, full eternity ring, crafted in 18ct. 18ct gold hallmarks. 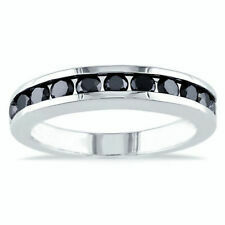 Full Eternity Ring. This eternity ring, being such a large size &. Fantastic Quality. Colour G / H - Clarity VS (assessed). 18 Carat white and yellow gold cluster diamond ring. gross weight 2.4 grams. The Midas Touch, based in Swansea, South Wales, provides a diverse variety of diamond jewellery and pre-owned watches. Our collection of precious jewellery is available in 9, 18 & 22 carat gold. 18ct GOLD Diamond .30ct Wedding Ring, GORGEOUS, *£695* "MASSIVE SALE" MUST GO! GORGEOUS 18ct GOLD Diamond. 30ct Wedding Ring "MASSIVE SALE" MUST GO! It is finger size Q and the gross weight is 4.6 grams. 12 x very bright brilliant-cut diamonds set in 6 pairs, set around the ring. 18 Carat white gold cluster diamond ring. gross weight 3.8 grams. The Midas Touch, based in Swansea, South Wales, provides a diverse variety of diamond jewellery and pre-owned watches. Our collection of precious jewellery is available in 9, 18 & 22 carat gold. 18 Carat white gold cluster diamond ring. diamond weight 0.25 carat. The Midas Touch, based in Swansea, South Wales, provides a diverse variety of diamond jewellery and pre-owned watches. Our collection of precious jewellery is available in 9, 18 & 22 carat gold. 9 ct YELLOW GOLD DIAMOND CLUSTER RING WITH RIVEN BARK SHOULDERS. A FINE RING IN GREAT CONDITION. FULLY HALLMARKED 375 GOLD. SI F 9K White Gold £312.00. VS F 9K White Gold £416.00. SI F 9K Yellow Gold £312.00. VS F 9K Yellow Gold £416.00. SI F 9K Rose Gold £312.00. VS F 9K Rose Gold £416.00. Round Brilliant Width This Ring is Also Available in Diamond Clarity SI, VS & VVS with 9K, 18K White, Yellow, Rose Gold & 950 Platinum. Round Brilliant Width Diamond Colour Diamond Colour. He is not dependent on us. We are dependent on him. He is not an interruption of our work. He is the purpose of it. He is part of it. SI F 9K White Gold £418.00. VS F 9K White Gold £558.00. SI F 9K Yellow Gold £418.00. VS F 9K Yellow Gold £558.00. SI F 9K Rose Gold £418.00. VS F 9K Rose Gold £558.00. Round Brilliant Width This Ring is Also Available in Diamond Clarity SI, VS & VVS with 9K, 18K White, Yellow, Rose Gold & 950 Platinum. Platinum 1.00 Carat Cushion Diamond Double Halo Engagement Ring. Carat Weight 0.50 Carat. Total Carat Weight 1.00 Carat. Shape Cushion. Carat Weight. 0.50 Carat. Center Diamond Details Side Diamond Details Diamond Color / Clarity. Baguette Cut Width SI F 18K White Gold £476.00. Diamond Colour VS F 18K White Gold £546.00. VVS F 18K White Gold £566.00. SI F 18K Yellow Gold £476.00. VS F 18K Yellow Gold £546.00. Diamond Colour. Round Brilliant Cut Width: 1.50mm. SI F 18K White Gold £338.00. VS F 18K White Gold £434.00. Diamond Colour VVS F 18K White Gold £510.00. SI F 18K Yellow Gold £338.00. VS F 18K Yellow Gold £434.00. SI F 9K White Gold £518.00. VS F 9K White Gold £698.00. SI F 9K Yellow Gold £518.00. VS F 9K Yellow Gold £698.00. SI F 9K Rose Gold £518.00. VS F 9K Rose Gold £698.00. Round Brilliant Cut Width This Ring is Also Available in Diamond Clarity SI, VS & VVS with 9K, 18K White, Yellow, Rose Gold & 950 Platinum. Baguette and Round Brilliant Cut Width SI F 9K White Gold £488.00. VS F 9K White Gold £642.00. SI F 9K Yellow Gold £488.00. VS F 9K Yellow Gold £642.00. SI F 9K Rose Gold £488.00. VS F 9K Rose Gold £642.00. Round & Baguette Cut Width Diamond Colour SI F 18K White Gold £718.00. VS F 18K White Gold £834.00. VVS F 18K White Gold £938.00. Diamond Colour. SI F 18K Yellow Gold £718.00. VS F 18K Yellow Gold £834.00.